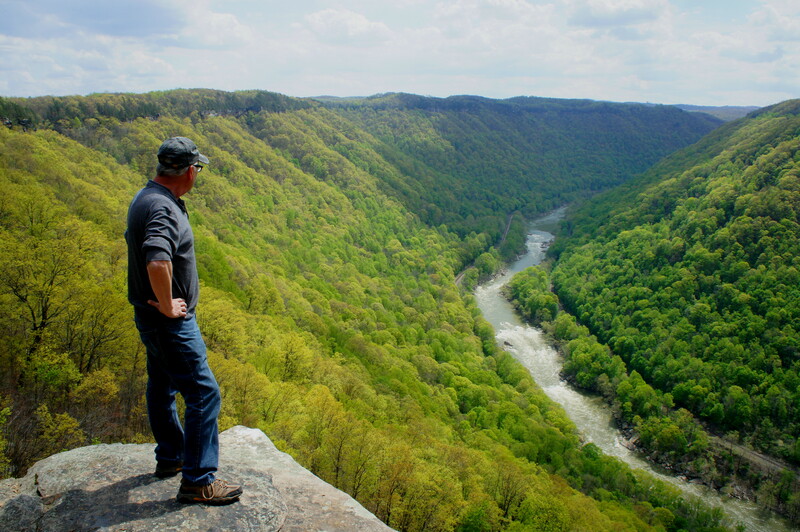 Epic cliffs, stunning views, and bushy rhododendrons define the setting of the Endless Wall Trail, one of the finest short hikes at West Virginia’s New River Gorge National River. 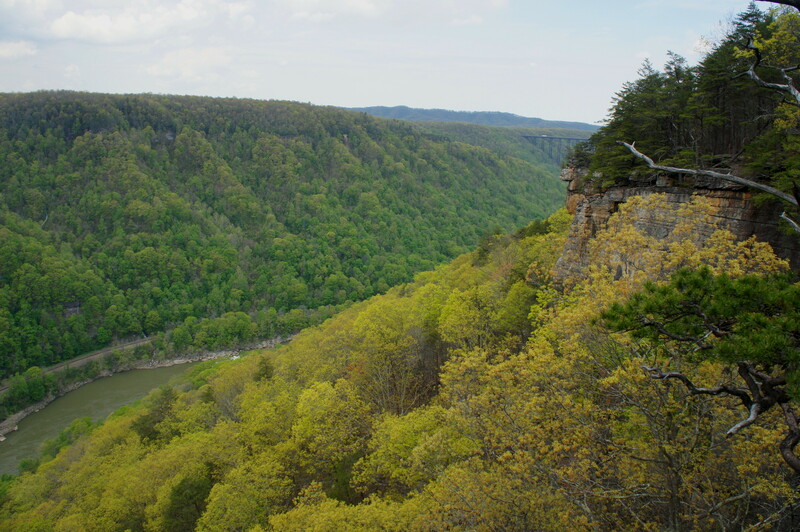 Take a moment along this 2.9-mile loop hike to soak in the vista from Diamond Point, where the deep gorge drops nearly 900 feet to the New River below. 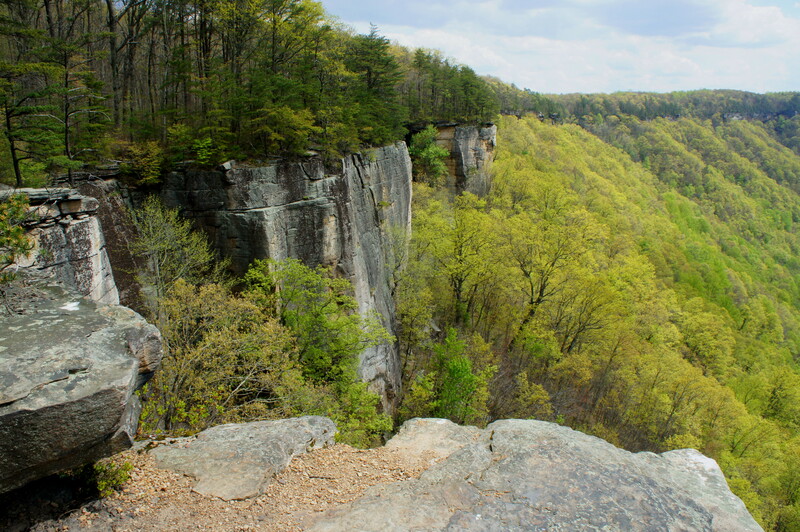 Rock climbers can access the base of the “Endless Wall” cliffs from at least three points along the trail. While still relatively unknown outside of West Virginia, the Endless Wall hike is quickly gaining attention: for one, the trail topped a list of the nation’s best hikes in the USA Today this spring. Both the Fern Creek and Nuttall Trailheads—respectively, 1.3 and 1.8 miles down the Lansing-Edmond Road (Route 82) from West Virginia Highway 19 north of the park—provide access to the Endless Wall Trail, but most will probably opt for the loop. For those with only one vehicle, the 2.9-mile circuit hike requires a ½ mile walk along the road between the two parking areas. Rhododendrons—spectacular in bloom—dominate the understory. Four-tenths of a mile from the trailhead, the route crosses Fern Creek, a gently cascading stream. Beyond—where the canopy comprises principally chestnut oaks—the trail climbs gently as it edges southwest. 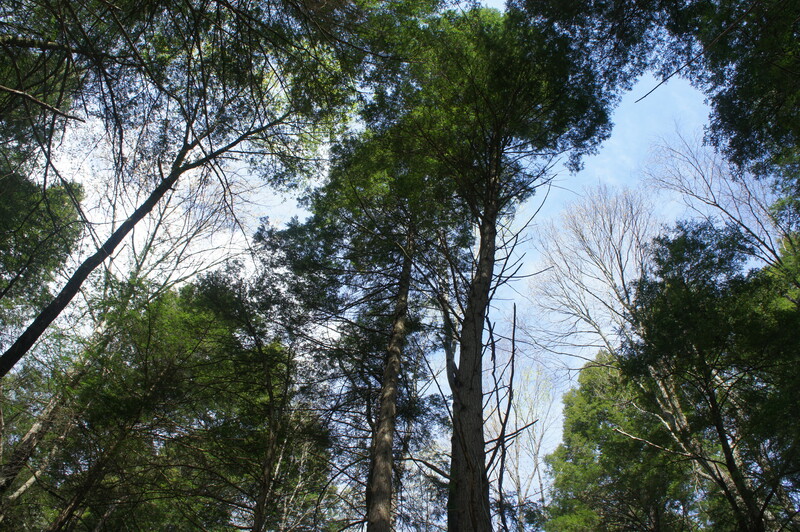 Around 6/10 mile, a spur trail meanders toward the Fern Creek ladder system, used by rock climbers. From here on, hikers can feel the presence of the gorge to the right, but it is not for another 4/10 mile that one reaches the short spur to Diamond Point, the best unobstructed viewpoint along the Endless Wall Trail. 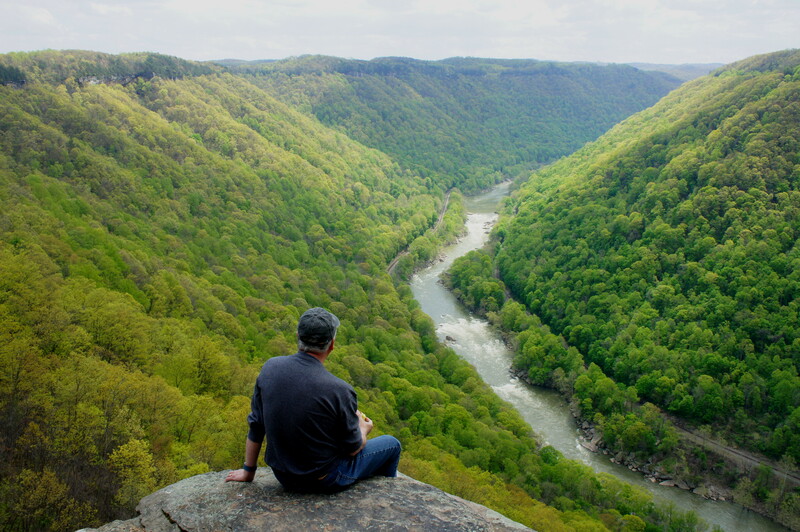 The overlook is likely to leave hikers awestruck—and perhaps acrophobic—when peering down at the river 900 feet below. While the brim of the canyon offers the best photo opportunities, be extremely cautious at Diamond Point, where there is not the slightest hint of a guardrail. To the northwest, look for the New River Gorge Bridge, the longest steel span in the Western hemisphere and third tallest in the U.S. Across the gorge, one can sometimes discern the waterfalls of Butchers Branch as well as remnants of the old mining operation at Kaymoor, in use from the late 1890s through 1962. Train tracks—still in operation—line both sides of the river. To the east, the New River tumbles over whitewater as it rounds a majestic bend. The near side of the canyon rim is scored with vertical cliffs of Nuttall sandstone, together constituting the “Endless Wall” for which the trail was named. Aside from serving as an aesthetic backdrop, the cliffs are now a hot destination for skilled climbers. Beyond Diamond Point, the trail flirts with the rim as it extends northeast toward the Nuttall Trailhead. The first marked spur on the right provides access to the Honeymooners Ladder, while a second detour nearly a mile farther leads to the “The Cirque” ladder system. 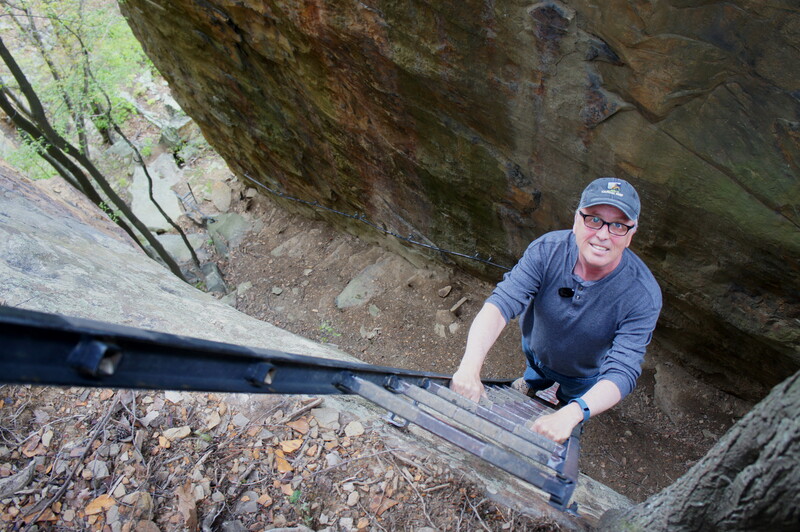 It’s fun to check out at least one of these spots, though of course exercise caution when descending. At two miles, the track turns sharply and cuts northwest for the final 1/3 mile. 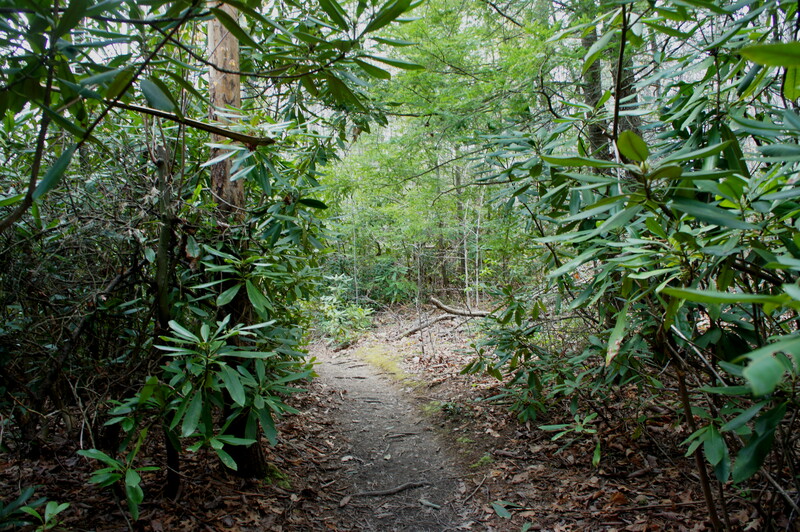 The trail crosses a series of minor footbridges as it weaves amid rhododendron thickets, then parallels private property before finally spitting out at the Nuttall Trailhead. From here, it is a ½ mile walk along the road back to the Fern Creek parking area. 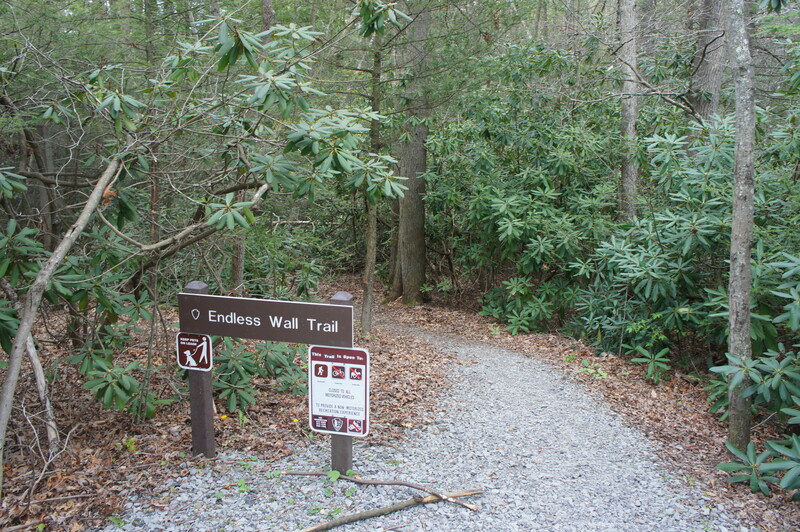 This entry was posted in Easy Hikes, New River Gorge National River, West Virginia and tagged Diamond Point, Endless Underworld, Endless Wall, Endless Wall Trail, Fern Creek, Fern Creek Trailhead, Lansing-Edmond Road, loop hike, New River, New River Gorge, New River Gorge Bridge, Nuttall sandstone, Nuttall Trailhead, West Virginia. Bookmark the permalink. If you get a chance, explore the Superior Hiking Trail for me, as that’s on my list.